I have contemplated getting the Litter-Robot III Open Air for a while but was always put off by the price. I finally broke down and bought one. After using it for a few months, I have to say it is definitely worth the money. The Litter-Robot III Open Air has many features but this review highlight the reasons why I think it is worth getting. Based on my calculation, I’ll make my money back in 2 years (from having to pay less cat sitting fees). Litter-Robot III Open Air is THE penthouse of all automatic cat litter boxes. The self-cleaning cat litter box has a large capacity litter chamber that makes it suitable for multi-size, multi-cat household. It uses a weight sensor to detect if a cat is inside. Once it leaves, the sensor waits a few minutes before starting a clean cycle. During the clean cycle, the globe turns and drops the clumps in the drawer. I have two cats. Prior to Litter-Robot III Open Air, I have to set up two litter boxes in the same proximity. Twice the cleaning, twice the mess, and almost twice the litter consumption. With the Litter-Robot III Open Air auto clean function, I only need one litter box since it is always clean for the next cat to use. To be fair, space-wise it still takes up the same (if not more) footprint. You win some, you lose some! The Litter-Robot III Open Air dimension is 29″ H x 24.24″ W x 27″ D. If you are like me and needed a visual cue, this is what the box looks like next to a large bag of World’s Best Cat Litter. That brings me to the next pros. 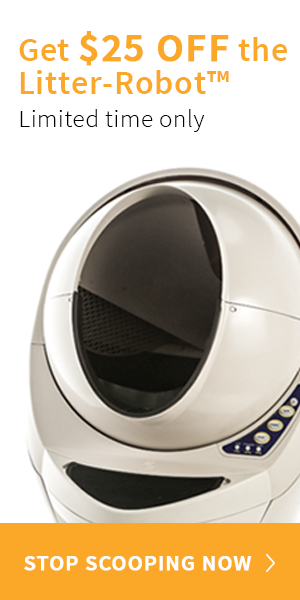 The Litter-Robot III Open Air uses about 1.5 gal or approximately 10 lbs of litter. My litter supply lasts longer since I don’t have to fill two boxes anymore. It takes about half a box of the medium Arm & Hammer Multi-Cat Clump & Seal Clumping Litter for the initial fill. I top up the litter as necessary and do a full purge once a month. Regardless of claims, litter WILL track. This is a fact that I have come to terms with as a cat owner. That being said, the rubber mat at the entrance of Litter-Robot III Open Air is very nice. The deep rubber slats has lots of traction to help catch most of the litter stuck on the paws. For the OCD in me I also like that the mat is removable for easy cleaning. Living in a small space, any cat poop and pee smell is noticeable pretty quickly. The carbon filter in the Litter Robot III Open Air waste drawer keeps the smell contained in between clean up. The filter is supposed to last a few months so we shall see. Since the size is pretty standard, I am planning to buy a big sheet of carbon filter like this one and cut it to size. The Litter-Robot III Open Air has a spacious drawer to collect spent litter. This means I only need to empty out the drawer twice a week for my two cats (the “full” indicator light will let you know). The drawer pulls out completely, which is a plus. That makes deep cleaning so much easier and manageable. I like that the drawer can be lined with ANY 10 – 13 gal (38 – 49 L) trash bag (take that Litter Genie!). I am using the Glad OdorShield trash bag since that is what I already use in the kitchen and it fits well in the drawer. However I do appreciate that Litter Robot III Open Air tries to be environmentally conscious. They produce biodegradable waste drawer liner and each unit comes with a sample liner. I usually keep a night light for the litter box but have always struggled on placement. I can’t seem to find a spot that would properly illuminate the inside of the box. The Litter-Robot III Open Air has a built-in night light inside the globe itself. The light sensor by the entrance will detect the cat and automatically turns it on and off. Pricey: It costs more than other auto litter box in the market but all the features makes it worth the money in our opinion. Huge: It takes up a lot of space and someone will DEFINITELY notice the spaceship sitting in the room. Rubber lip: The lip at the entrance of the dome doesn’t stay. I had to superglue it to stop falling. Clumping litter only: The Litter-Robot III Open Air needs clumping litter to work properly. Some silica gel litter and crystals can work as long as they can pass through the screen. Drawer full false indication: The spent litter piles in the drawer to form a “pyramid”. Because of that, the “drawer full” indication light tend to show up before the drawer is actually full. I had some learning curve trying out different clumping litter before finally finding one that doesn’t give me that problem. Weight limit: The weight sensor may not work if your cat is less than 5 lbs (e.g. kitten). As a workaround, they recommend manually powering up the litter box when cleaning is needed. I don’t think it is a big deal since you don’t have to manually scoop, but it does take away from the full automation that the Litter-Robot III Open Air is designed for. Want a Litter-Robot III Open Air? You can use my link to get $25 off from Litter-Robot Shop for a limited time. Alternatively, buy it from Amazon. TIP: Already bought a Litter-Robot III Open Air? Check out how to set up your Litter-Robot III Open Air in 5 easy min!